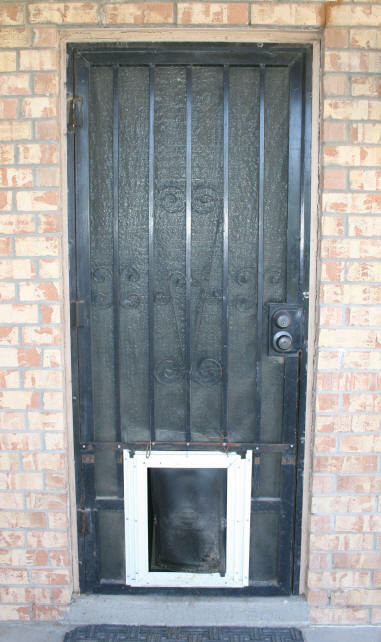 This particular wrought iron screen door has several issues that differ from the other screen doors on this house. First off, it is not used as a screen door with a screen. The other obvious item is the doggy door cut into the wrought iron. I looked all over the web for someone else that has done this. Again, nada. Back when we bought the house we only had one dog. He was an older dog who had lived in nothing but apartments his entire life, where he had to be taken out to take care of his business. Now that we had a house with a protected backyard, we wanted to give him the freedom to take care of business... when he wanted to. Inside of backyard screen door So we decided to installed a doggy door. The problem was, where to put it. Each outside door of this house has two doors. 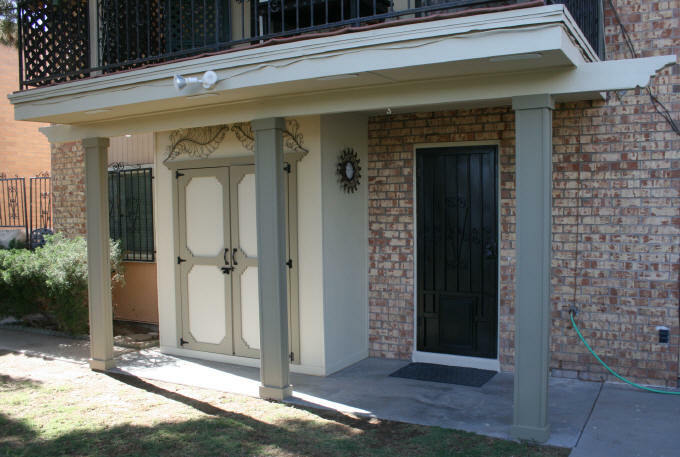 A regular outside door and an outer wrought iron screen door. 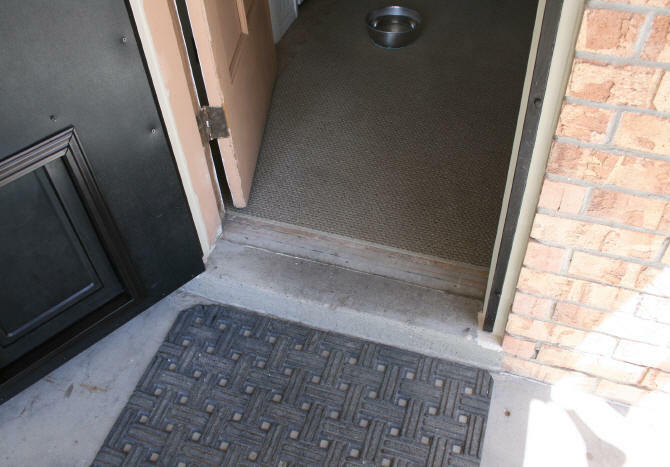 If we installed the doggy door on the regular door, the screen door would need to stay open all the time or be removed. Well, leaving it open was not practical and removing the wrought iron door would remove the additional security we had on this entrance. 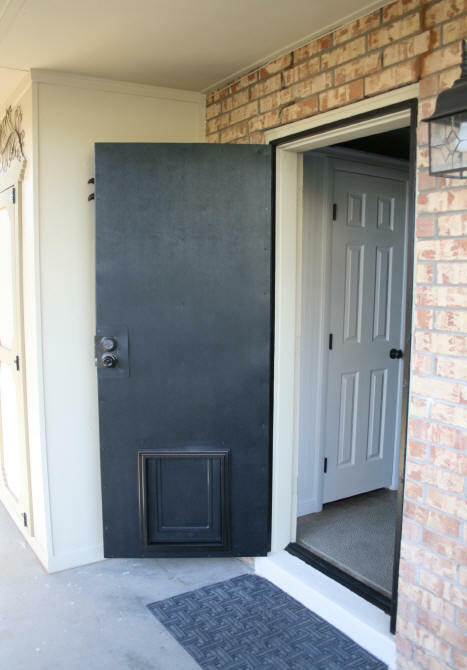 My husband came up with the idea of cutting out the wrought iron for the door at the bottom, using metal strips to provide a frame, and then installing the doggy door. This would mean that the regular entrance door would be open all of the time. 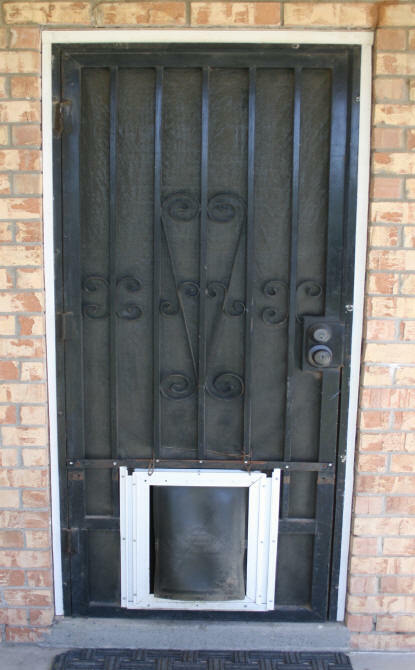 For security, this was OK because we would just lock the deadbolt on the screen door. 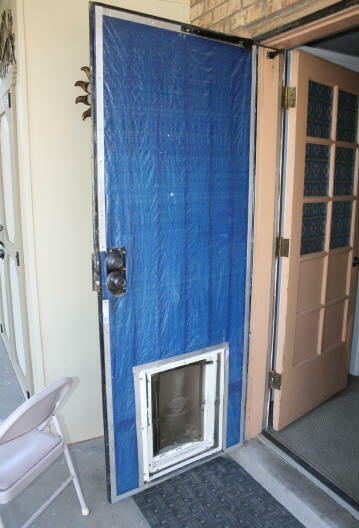 Later he added the blue tarp to help insulate this door from wind, heat, and cold. When we want to keep the dogs in the house, we just close the regular door. Now in 2014, I will be fixing some issues with this door. 1) The doggy door flaps need to be replaced. 15 years of abuse and slobber will do it. 2) The doggy door frame needs to be replaced. 3) The wood that the metal door frame is mounted on, has shrunk and shifted so the frame has spread to the point that the door knob latch barely sits in the strike hole (no plate, just a hole in wrought iron). 5) The blue tarp has to GO. 6) The metal strips that are holding the tarp on, need to be painted to match the door or removed. 7) The door threshold needs to be fixed into place. It is currently loose. Wood holding frame has weathered and shrunk. It is also recessed behind the door frame. The first thing I did was to go online and look for the doggy door that needed to be replaced. Just replacing the flaps was an option. 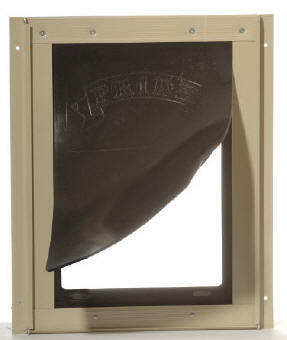 What I soon discovered, was that our Pet Safe door, was now a discontinued model (of course!!!!). I was afraid to just order a replacement flap because frankly I was not sure it would fit correctly. So I just decided to order a whole new doggy door. I was pleasantly surprised to find a model that had different color frames. 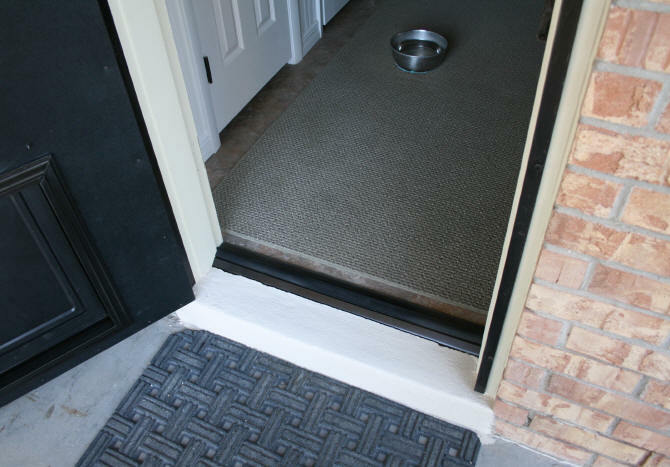 The Pride brand of pet doors comes in five different frame colors and is supposed to fit thin door surfaces like sheet metal. 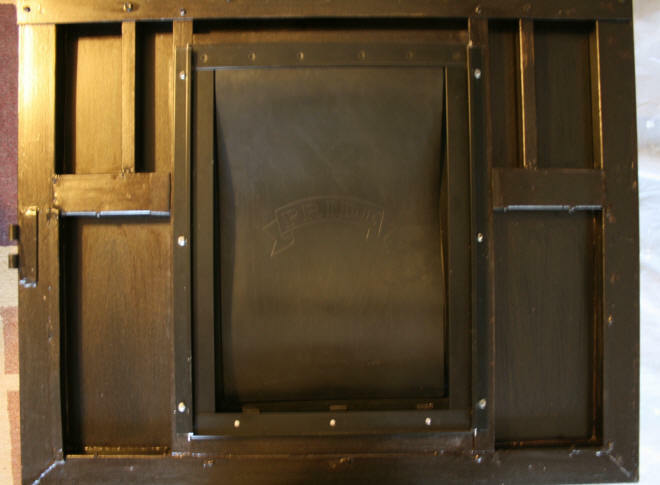 So I ordered on May 4, 2014, the large pet door in a black frame from The Pet Door Store. They had the best price with shipping than a couple of other websites. $74.95 + $12.50 shipping. I wanted the black frame to match the color of the door frame. The existing white frame is the first thing you see when you look at this door. Also, it looks dirty all of the time. The next item I looked for online, was a material to replace the blue tarp. While the blue tarp has kept the door somewhat insulated, the screen door still looses a lot of heat during the winter. During hard freezes, I need to close the door and just let the dogs out every few hours. I thought of some thick 6mm plastic but wanted something a bit more rigid. I thought of the clear polycarbonate I used on my entrance way window but wanted something opaque so the door looks black from the outside, like the other screen doors when I changed the screens. The material needed to be durable, rigid, and thin. I looked online at expanded PVC sheets. The $150.00 shipping charge made this an unreasonable choice. At the minimum, I needed a sheet 31" x 80" to cover the door. Even cut down to this size, the shipping was the same. There is a company in town that sells a variety of industrial plastic products so I took a trip to the east side of town to Piedmont Plastics. Looking at their sample pieces, I decided on a totally different material. Also, they would of had to special order the black expanded PVC I had originally wanted. I did not want to have to come back. The material I actually purchased was ABS. (Acrylonitrile butadiene styrene) a material used to make car parts, cases for computers, Legos, etc. It is thin but impact resistant. It's color will fade over time, but I can then paint it. It was also thin enough for this door, but rigid enough so it will keep the weather out and stand up to dogs possibly clawing it. The salesman said that it would cut easily with my table saw. I will cut the ABS when the dog door arrives, so I know what size of opening I will need to cut. In the meantime, I decided to address the issue with the door frame and the shrinking wood. What I did not like about this wrought iron door was how the wood for the frame is sunk in. Not only does this allow water to collect, it is a pain to caulk and paint. All of the other wrought iron doors at this house, were mounted on wood that was mounted ON TOP of the door frame. I knew I would have a heck of a time scrapping and sanding this wood to prepare it for painting. I came up with the idea of bringing the door frame "out". What if I inserted some wood moulding into the sunk-in sections around the iron frame to make the wood frame look like it is around the iron frame. This would; 1) Hide the ugliness of the old wood, 2) Provide an easier raised surface to caulk and paint, 3) Squeeze the metal door frame inward a little so that contact with the door latch would be increased. I picked up some 1-3/4" x 11/16 moulding at the hardware store. I chiseled off raised areas on the old wood and got rid of some excess caulking so my new wood would lay flat. The top piece went in easily. I only had to shave off about 1/8" to wedge it into the opening. The side pieces were different widths. The uneven brick surface did not help. After several trips back and forth to my table saw, I managed to tweak the wood size to be able to wedge the moulding into each side of the frame. I then nailed the moulding into the old wood with finishing nails. It came out great. I will sand down the wrought iron before I caulk and paint the wood. It also squeezed the metal door frame towards the center so the door now closes better with greater contact for the door latch. May 9 - 12, 2014 - The dog door arrived on Friday, May 9, 2014. I took it out of the box to see what I had to work with. Two pieces. The outside section with the flap and a thin inside frame. I took a look at the existing white frame to see if I could just stick the new door on the existing frame. A big fat NO. I asked my husband how he had built the existing frame. It was actually a smaller frame mounted on a larger frame. The screw placement for the old frame did not match the new. So I took off all of the white frames. Now I had a big hole that was too large for the new door. What do I do now? I needed to make a new frame for the new dog door. In my garage I have a scrap metal pile that I plan to eventually recycle. In that pile is some wrought iron. I found a piece that still had 1" square rails and cut off two pieces. I used my Dremel Saw Max for this with the metal cutting blade. These would be my side rails to mount the door on. To mount them was another story. I first tried screwing it to the piece of sheet metal that goes across the bottom of the door about 2 feet up. But there was nothing to support the two rails on the bottom. The wrought iron is hollow. I tried Liquid Nails but it fell apart. I needed something solid to attach the bottom of the rails to. I had a a 1" x 1" piece of wood that I cut to fit the bottom of the opening. I then used Liquid nails to stick it to the bottom rail of the door. I then bolted the two side to the beam. I also added a wood beam to where the top of the new dog door would rest. I additionally needed to drill through to the other side of the wrought iron at the top and bolt all the way through the metal. The one thing with metal, screws do not hold for long in a high stress area. You need to use a bolt and nut through the metal. Holes were drilled through the wrought iron and into the edges of the wood. 2 1/2" screws are holding it in place. The new door frame is very solid now. See the new frame in the photo below. New dog door frame added to the bottom of the door. With the new dog door frame securely in place, it was time to cut and screw the ABS sheet on the door. I cut the ABS sheet on my table saw. The cuts needed around the door knobs and dog door opening were done by hand with a metal scissor type cutter. After positioning the sheet, I drilled holes through the sheet and used screws to hold it in place. Notes on cutting this ABS sheet on a table saw. Find someone to help you. To do it by yourself is a pain. The sheet kept flopping around. I had it sitting on top of my two trash/recycle bins to keep it stable as I ripped it through the saw. 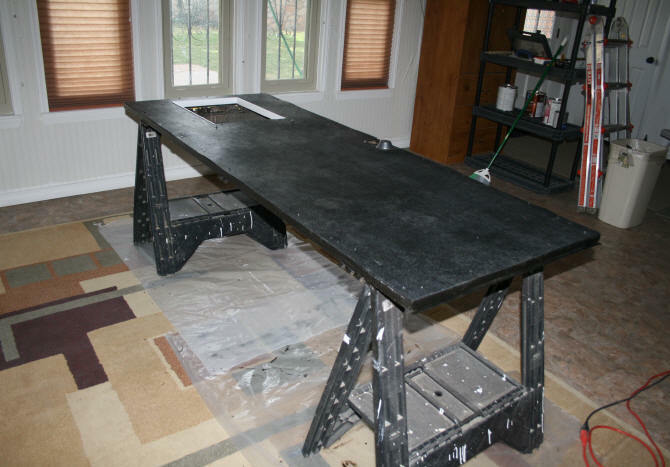 You could also try laying it flat on some plywood, level with your table saw. I did not have any plywood. ABS sheet added to inside section of door. 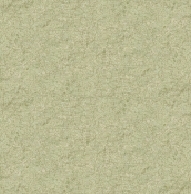 decided not to use it, which is why it looks white around the edge. Now that I had the ABS sheet on, it was time to work on the outside of the door. 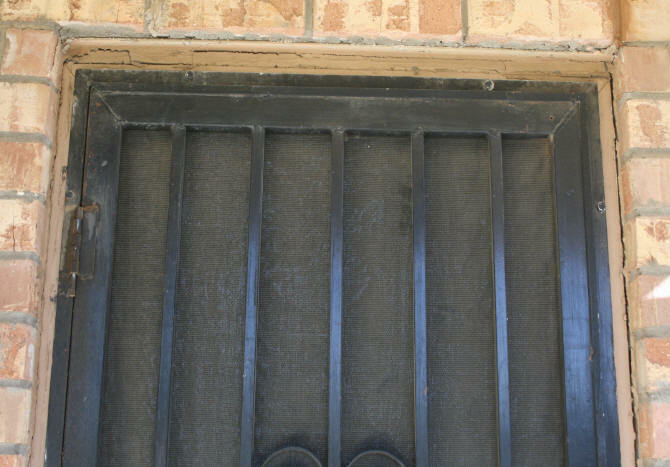 Since the old dog door frame was larger, there were 2 sections of the wrought iron that had gaps. I needed to fill the gaps with something, so they would meet the new frame. What I did to fill the gap, was to use some scrap PVC trim board. I cut the pieces to fit in the gap exactly and wedged it in with a hammer. After sanding down the metal on the door and filling a bunch of old holes in the wrought iron, I was ready to paint the outside of the door. The photo below shows the outside of the door with the first coat of paint. Because the salesman told me the ABS would fade in sunlight, I decided to paint the sheet on this side at the same time as the wrought iron. May 13 - 14, 2014 - After the first coat of paint had dried on the outside of the door, I attached the dog door. The door only has six mounting holes . Three on each side. None on the top or the bottom. I knew that the little tiny screws included with the dog door would not be strong enough for this set-up. I needed to make the holes large to attach my larger bolts and screws that would go 1) through the dog door frame, 2) the entire piece of wrought iron, and 3) through the ABS sheet on the inside of the door. 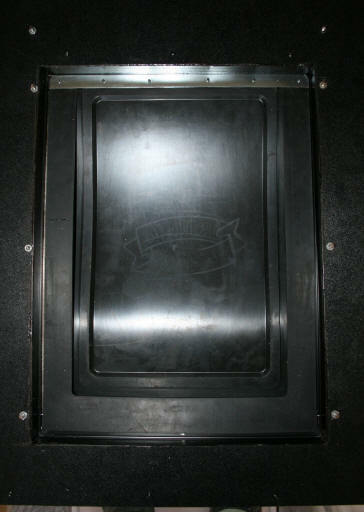 View of the dog door on the inside after installation The one thing that bothers me about manufacturers who DO make metal products in darker colors. 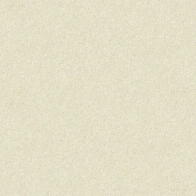 They forget to make everything the darker color. The screws, the metal edges, etc. You will have this beautiful dark piece of hardware with shiny silver screws. Grrr. In the picture above, they did use six black screws to mount the flap on the top, but used silver bolts on the bottom section of the frame. Also, the metal frame was painted, THEN cut. So the edges of the cuts are silver. All of which I will need to paint. The photo on the left shows the dog door as seen on the inside of the door. First off, the dog door mounting bolts are too close to the edge of the door. Potential dog hazard here if all of the dogs are trying to get out at the same time. Also, the metal strip at the top that holds the screws for the dog flap can be seen. On a regular door, this metal strip would be hidden. I needed to cover the mounting bolts and conceal the strip. The frame that came with the door would not do any of this, so I did not use it. Besides it is a thin aluminum piece that has a sharp edges to it. So I decided to make a frame out of some PVC moulding. On the side pieces, the PVC would be carved away on the back where the bolts are, so it would lay flat. I would lower the top of the frame so it would conceal the flap holding strip from view. The frame was then spray painted. 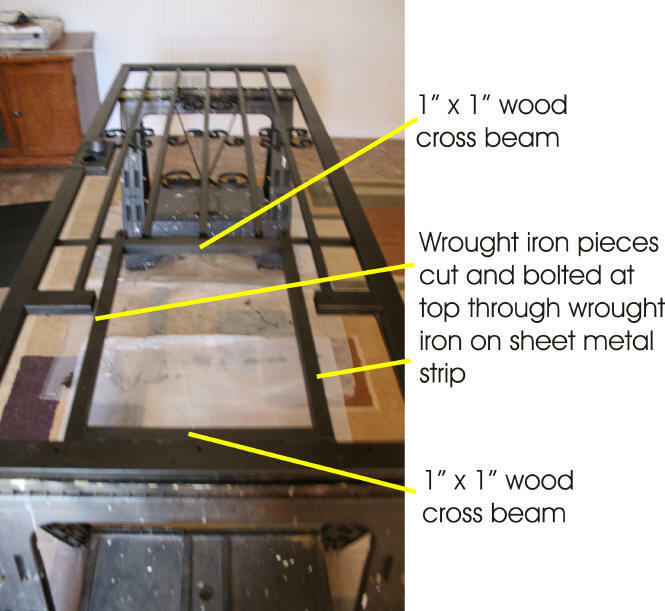 Completed inside of wrought iron door with installed dog door and frame The top and bottom sections of the frame are nailed into the wood cross beams on the frame. 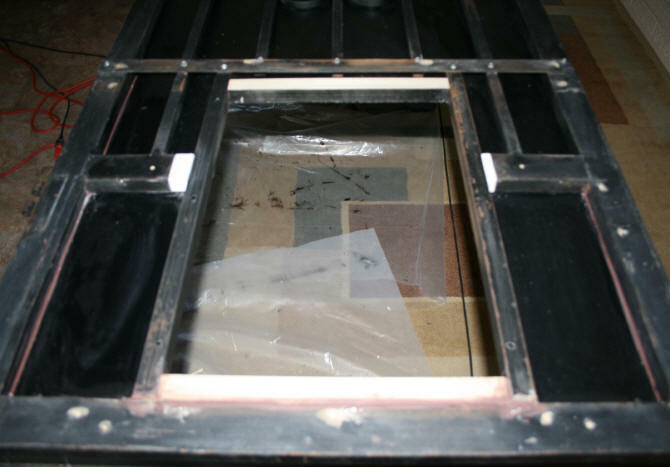 The side pieces were glued in the corners where they meet the top and bottom of frame. With the frame in place, the mounting bolt edges are now covered. 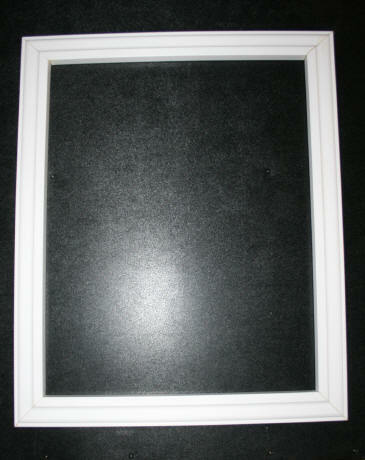 The lower frame at the top conceals the flap mounting strip. A plus side to this mounting, is that the flap can be changed without removing the outer frame. 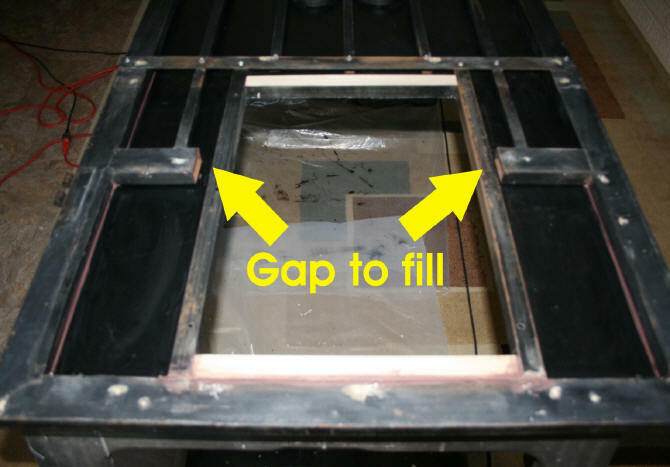 On a traditional door, you need to remove the outside frame to mount a replacement flap. 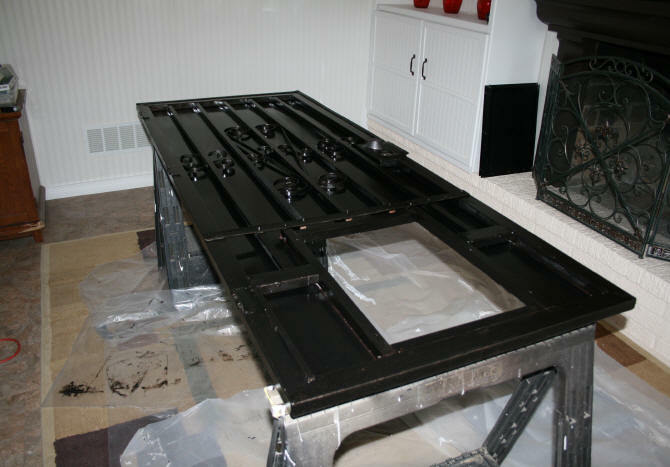 Before hanging the door back up, I needed to paint the surround door frame and wrought iron. The photo on left shows the completed door on the inside. The wrought iron is completely covered. The only area where air can get in, is on the edges of the door where I will use some type of weather stripping. 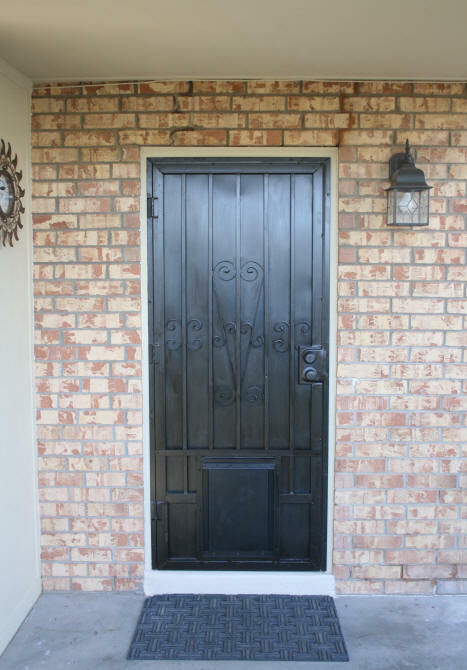 The photo on the right shows the completed wrought iron door on the outside. Now, when you first look at the door, you see a black door and THEN the dog door. In the photo below you see the entire area around the door. At a distance you hardly notice the dog door at all. This is about as clean as this door will ever be. Dog slobber will change this shortly. There was a slight re-learning curve for the dogs for this door. Since the whole door is black and the flap heavier, I had to teach them how to use it again. An older dog figured it out right away. The youngest dog, is still getting used to it. View of patio area. Dog door barely visible. Cement on patio will be painted later to match door stoop. For the loose door threshold, I removed it. The threshold was only a couple years old and was installed after I retiled this downstairs floor as part of the man cave project. The rubber was still good, but the paint had started to flake off. So I removed the rubber, sanded down the aluminum, and spray painted it with a dark oil rubbed bronze color. There was a missing chunk of cement on the far left corner of the stoop that I patched. I also needed to paint the door frame down to the floor so the wood hidden by the threshold was protected. The last step was to paint the stoop with the paint I would be using later on the cement outside. I wanted to have this section painted before I glued the threshold down.